I am a sourpuss. So, when daughter Anna pointed out that California will subsidize the purchase price of electric motorcycles, I groused. Electric motorcycles, I complained, aren't as green as they seem, since the power has to come from somewhere (a power plant). But what was really bothering me was the motorcycle Gov. Schwarzenegger was astride: it looked like a plastic toy. 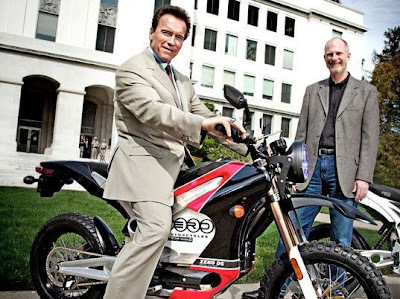 The Zero brand electric motorcycle is the first to qualify for California's $1,500 rebate program. Since this is a motorcycle blog, I guess I am supposed to like it. But it wasn't easy. 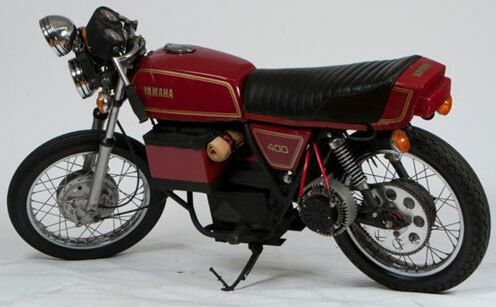 Electric motorcycles, I whined, don't provide the vintage experience I'm looking for. Not if they look like that. Then Anna pointed me toward an item about Blindspot Cycles, on the Inhabitat (Design Will Save the World) blog. Blindspot Cycles recycles a Suzuki. Here is the legitimate motorcycle look I wanted: real fenders (shiny ones), a round headlight and upright riding position. There is even a center stand. 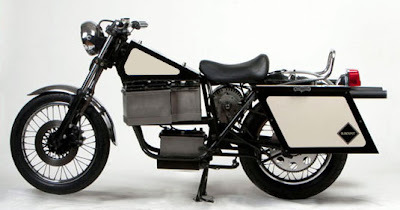 The flat-tank look reminds me of the earliest motorcycles. 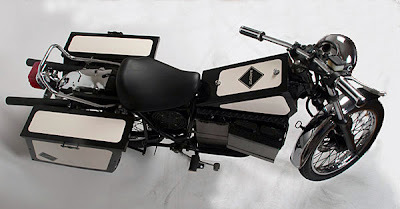 The parallelogram panniers recall Art Deco. "Reuse starts with a trip to a salvage yard looking for the right cycle. All makes and models have potential. They first help a client choose just the right ride. "These reclaimed motorcycles squeeze the past and future together. Coupled with a DND DC permanent magnet electric motor, a set of Deka brand AGM batteries and some styling you get a home-brew, super efficient ride. If they can find it salvaged rather than new it goes on. If it is high quality and American made then it goes in." Blindspot Cycles has managed to capture a style that says the motorcycle was imagined by human beings, in the past, not by space aliens in 3030. Now, these are green machines that I could like. Love this! Thanks for the recognition dad. I do have one question: how much do they cost!? They start around $5,000. What some people don't realize is that even using coal-produced electric, you can obtain much higher efficiency. Coal power plants run at about 50% efficiency and gas engines at around 20%. I saw a converted motorcycle that obtained an MPG equivalent of 425. Also think of the inefficiency (read: absurdity) of transporting fuel from the Middle East to your local gas station, not to mention all of the processing involved from crude oil. Compare that to sending electrons through a wire from a U.S. power plant.